Cary, NC – Who loves cheesecake? We do, and our good friend Jane made this one for a St Patrick’s Day dinner, but really it’s great for Spring or Summer. 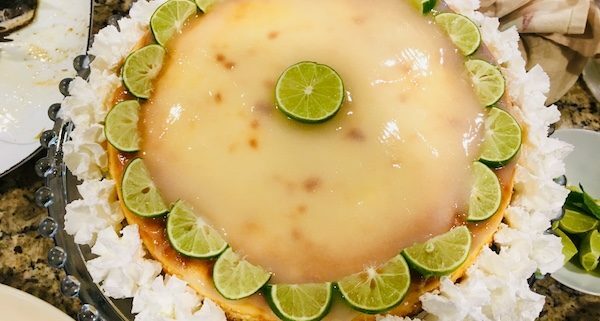 The fresh zing of lime coupled with creamy cheesecake is a great combination. And being Italian and from New York, we just know she knows her way around a good cheesecake recipe. This one won’t disappoint and she swears it’s easy to make. 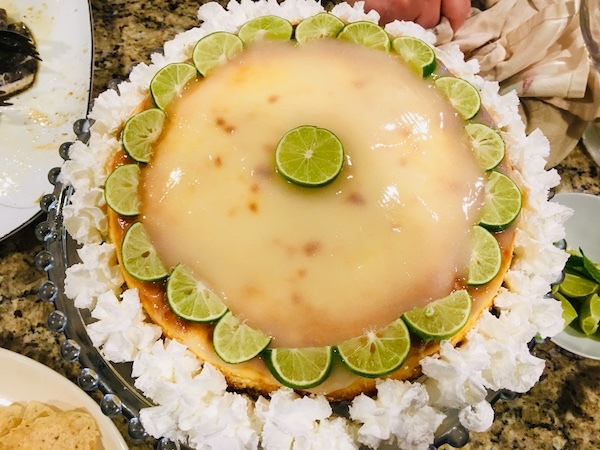 Jane provided us with her basic cheesecake recipe, with the key lime option that she had made for us, and also gave us options for alternative ingredients should we get adventurous in our baking. Mix together and pat into spring form pan. You can also experiment with other crust ingredients such as chocolate wafers or even ginger snaps, depending on the type of cheesecake filling you are making. Beat this all together with an electric mixer until well-blended and fluffy. Pour into the springform pan on top of the crust. Bake at 450 degrees Fahrenheit for 10 minutes, then reduce temperature to 350 degrees Fahrenheit for 35 minutes. Cool cake before removing from pan and glazing. Heat these ingredients over medium heat in a saucepan. Add cornstarch/flour to thicken. Whisk mixture thoroughly and strain to remove any lumps. Cool before spreading on cake. Garnish with lime slices and whipped cream! The basic ingredients of cream cheese, sugar and eggs make for the classic cheesecake filling. Variations can include chocolate or berries which you can add in about the quantity of the lime juice. Experiment and let us know what you try!